I bought nine packs of retail 206 and eight packs of hobby at The Back Stop (the home of Dr. Wax). After looking through the packs, there are some notable differences. 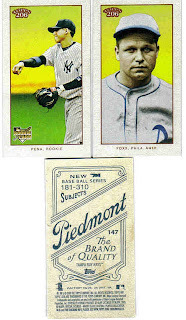 There are two autograph or relic cards per hobby box. There are similar odds for retail, but I am not entirely sure what the odds are. 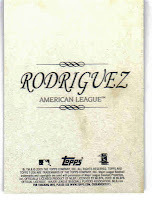 The 1/1 Carolina Brights, cut signature books and printing plate are exclusive to hobby. You cannot pull these out of retail. Here was my break down. Hobby: 54 cards, 2 Mantle checklists. No doubles. Retail: 35 cards, 1 Mantle checklist. Four doubles. And not one single Derek Jeter card. You destroyed the odds with those two autos. Congrats! That seems like a freakazoid blaster to me. 2 Cycle backs, and an auto? You definitely killed it the odds with that one. The retail were loose packs. I didn't pick up a blater. I have a Jeter base card from the set. Bought it off eBay last week. 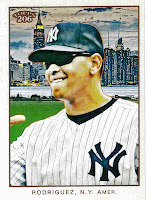 I was just noting that I never pull Jeter cards. And you live near Dr. Wax! You are lucky. I used to watch his breaks all the time. Seriously though, gnarly retail spread. Some the minis I've pulled from T206 are of a different sort of card stock - a little more like the bronze parallels than the base cards. Have you noticed this, or maybe I'm just getting a few weird ones? Semi-salivating over the Andrus redemption. Only semi because its a redemption. Nice pulls from the retail packs. Retail FTW. As many retail hits as I've been seeing from bloggers, I wonder if the thick bronze cards are actually causing problems for pack searchers. You'd think with relatively easy odds for autos, they'd be all over it. You're pulling all of the Red Sox hits and I'm getting Old Mill framed A-Rod bat relics here in Boston. It figures. Great pulls for the amount of packs that you bought. Congrats. 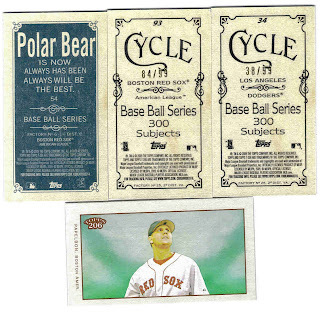 If it were up to me, every time I touched a pack, the Red Sox cards would magically disappear and be replaced by Yankees. But it's not and I get a stinking pile of rubbish instead!